It's becoming increasingly common for people to make their own dog food at home. After all, it's important to balance our pets' diets to keep them active and healthy. But what human foods are safe for dogs? TODAY spoke with Dr. Jennifer B. Berg, owner of Tribeca Veterinary Wellness clinic, and Dr. Debra Zoran, Ph.D. in canine nutrition and veterinary professor at Texas A&M University, to find out how natural ingredients should factor into a healthy and balanced diet for our pets. According to Berg, sweet almonds (the kind humans eat) are not toxic but bitter almonds (the kind that grow commonly on trees in backyards) are highly toxic. "Nuts in general are wise to avoid, as they are higher in fat than many dogs can tolerate, and can therefore cause pancreatitis," she said. Molds are also common on many types of nuts and can cause liver disease and neurological problems in dogs, according to Berg. She also added that macadamia nuts are highly toxic to dogs and can cause temporary paralysis, tremors, ataxia and even death. "Chocolate-covered macadamia nuts are a nightmare for dogs!" she said. When it comes to apples, while the skin is high in fiber, the fruit has a high sugar content that can disrupt a dog’s regular diet. "Apple seeds have compounds that can produce small amounts of cyanide," said Zoran. " A very large consumption of seeds is required to reach a toxic level, but to be on the safe side I generally just recommend that the seeds and core be removed." While dogs can eat avocado, the pit can pose a choking hazard. "The pit of the avocado, just like peach pits, (is) very dangerous for foreign object ingestion and obstruction in dogs," said Berg. She also warned that the high fat content of avocados makes them an indulgence for dogs rather than a staple. "Since avocados are high in fat, consuming them can also cause pancreatitis and gastroenteritis," said Berg. "So just be careful about how much you're feeding to your pets." According to our experts, it isn't harmful to feed bananas to your dog, but it's also not something that should be a huge component in your pet's diet. "Dogs can eat bananas but not the peel," said Zoran. "However, they don’t often prefer them, which may be based on their smell or taste." Zoran stressed that feeding treats to your dog too often can cause problems and even lead to unwanted weight gain. "When you add treats to a diet that is complete and balanced, treats can unbalance the diet if they make up more than 10 to 15 percent of the total." Berg suggests reducing other food in your dog's diet to control calorie intake if you give them a lot of special foods. "It's OK to give your pet a very small piece of banana, but not too much," she said. "Bananas are very high in sugar and could easily cause your dog's calorie intake to be unhealthy." Carrots, cut into small pieces, are a healthy alternative snack for dogs, but Berg recommends her clients to consider dark green vegetables if they can get their dogs to eat them. Dark green vegetables are packed full of the vitamins your dog needs but lack some of the sugar that sweeter vegetables like carrots contain. "Generally it's better to use small pieces of broccoli or string beans instead," advised Berg. It's important that dogs get enough essential fatty acids because they have unique oil requirements compared to humans. "Dogs can't produce linoleic acid (an EFA) so it's best to give them an oil that is rich in linoleic acid," said Berg. "Corn oil is very high in linoleic acid, as is walnut oil. So, though humans tend to love coconut oil, these choices are better options for dogs." However, there are still benefits of coconut oil, according to Zoran. It's rich in a different fatty acid, medium chain triglycerides, which have proven in some studies to increase cognitive function in older dogs. But many dogs will refuse coconut oil because of the taste. She also cautions that any kind of oil is highly caloric and must be carefully introduced into a dog's diet. "Dogs prone to obesity must have the addition of coconut oil into their diet carefully considered," said Zoran. "It also should be used cautiously for dogs prone to issues with added fat in their diets, like those with pancreatitis or some liver diseases." Eggs are often used in homemade and commercial dog foods and, according to Berg, they're an excellent source of protein for dogs. She thinks eggs may even be better for dogs than humans. In humans, the high cholesterol of egg yolks can contribute to fatty buildups in the arteries and cause atherosclerosis plaque blockages. But dogs and cats, apart from those with rare metabolic disorders, don't run into that problem. "Dogs and cats are meant to digest animal proteins and animal fats," said Berg. "Their arteries don't get the atherosclerosis plaques that humans get from eating eggs." Zoran recommends seeking expert advice before putting your dog on a homemade diet. 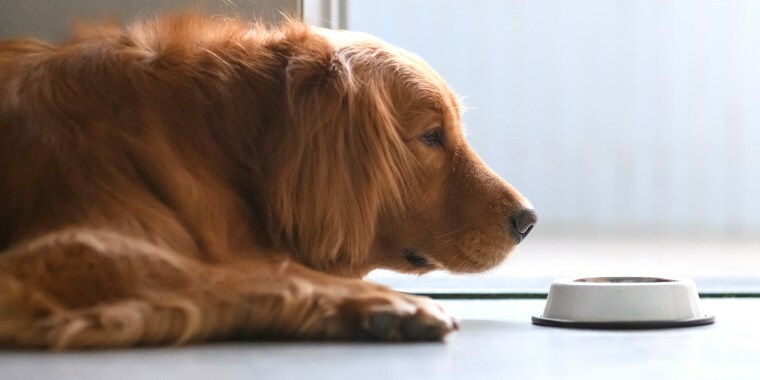 "If you are using an entirely homemade diet to feed your dog," she said, "it is very important to consult a nutrition specialist to help you formulate a diet that is complete and balanced for your dog’s life stage and activities." According to Zoran, it is unsafe for dogs to consume grapes or raisins in any quantity because the fruit has been associated with acute kidney failure in animals. Zoran explained the toxicity of grapes is unpredictable, which makes it difficult to determine whether or not your pet will have an adverse reaction to them. "Some animals can eat grapes without causing apparent harm," she said, "while another animal can eat as few as one or two and have a life-threatening kidney injury." The toxin in grapes that can cause kidney failure hasn't yet been identified but is thought to be associated with the flesh of the fruit. This means that seedless or skinless grapes can still be toxic to pets. "You never know how any one animal will react to any amount of grapes," said Berg. "So if a dog does ingest grapes or raisins, the owner should seek immediate medical attention." Even a small amount of onion is severely toxic for dogs, according to Berg. Onion is considered dangerous for dogs in all forms: raw, cooked, fried or powdered. In fact, any and all parts of the allium family (including leeks, chives, garlic and shallots) are highly toxic. These ingredients contain a compound called allyl propyl disulfide, which causes a breakdown of red blood cells in dogs and can lead to severe anemia. "Onions are highly toxic for dogs, even in low numbers," said Berg. "They cause severe enough anemia to require transfusions." Pineapple is safe for dogs to ingest, however, it's not recommended by veterinarians because it's highly acidic and can be tough on a dog's stomach. Zoran cautions that fruit is not suitable for all dogs. Dogs with bladder stones or diabetes should not have fruit, according to our experts. "In dogs prone to developing calcium oxalate uroliths (a type of bladder stone), it is generally recommended that all fruits be avoided," said Zoran, "as they tend to contain a lot of the oxalates that make stone formation more likely." When it comes to strawberries, it's complicated. Recent studies have shown that using strawberry extracts in canine diets can increase antioxidants to improve cognitive function in older dogs. However, strawberries in their whole form contain histamines, which have been associated with allergic reactions in dogs. But there is little data on the effects of whole strawberries in a dog's diet. Zoran suggests incorporating strawberry extracts in your dog's diet as opposed to fresh strawberries. This, she says, will allow your dog to reap the rewards of antioxidants without risking an adverse reaction to the seeds or flesh of the fruit. Berg warns that strawberries are also high in sugar. "Look at your dog's total calorie count for the day," she said. "My concern with strawberries is that it will cause your dog to have too many calories, which can lead to obesity." Are tomatoes toxic? According to our experts, they are and they aren't. Ripe, red tomatoes are safe for dogs to eat, but they can give many dogs an upset stomach due to their high acidity. Canned tomatoes are less acidic than fresh tomatoes, so these are a safer alternative, said Berg. "Tomato is not really deadly but can often cause gastroenteritis in dogs," she added. But watch out when it comes to unripe tomatoes and tomato vines, which are considered toxic to dogs. Tomatoes belong to the nightshade family, which can be toxic to pets. The leaves, vine, stem and unripe flesh are toxic to both dogs and humans. They contain glycoalkaloids that can cause lethargy, vomiting, diarrhea and changes in behavior. If a dog ingests these parts of a tomato, they should be given medical attention. Watermelon is OK for dogs, but not great, Berg said. While nontoxic, watermelon is very high in sugar, which can disrupt your dog's normal diet. "That being said, eating a small piece would not be harmful!" she said. Berg recommends altering your dog's normal diet to compensate for the extra calories added by sweet treats like watermelon to ensure that your dog isn't at risk for obesity. The final verdict: Can dogs eat fruits and vegetables? "Fruits and vegetables can be included in a dog's diet," said Zoran, "but again, it's critical to consider quantity, nutritional value and safety before incorporating anything new into your pet's regular diet." Berg says a majority of her clients struggle to keep their dogs at a healthy weight and that it's common for overfed dogs in her clinic to become dependent on insulin. According to the Association for Pet Obesity Prevention's 2017 clinical survey, 56 percent of dogs in the United States are classified as clinically overweight, an increase from 54 percent in 2016. "It's very important to make sure your veterinarian is aware of all the foods you feed your dog," said Zoran. "Diet and nutrition have an important impact on health, both negative and positive."